Nature is having a major moment right now. Green walls are popping up in offices, trails of ivy can be found in nearly every coffee shop, and tropical plants are sprouting from pots in people’s homes. Even within dense cities, once forgotten parcels of land are being turned into blossoming urban jungles. This trend is more than just a resurgence in the interest of plants. It’s an example of how people are looking for new ways to reconnect with the natural world. In design, “sustainability” has long defined our commitment to the environment, and today, every good architecture firm is committed to designing environments that diminish impact on the natural world. 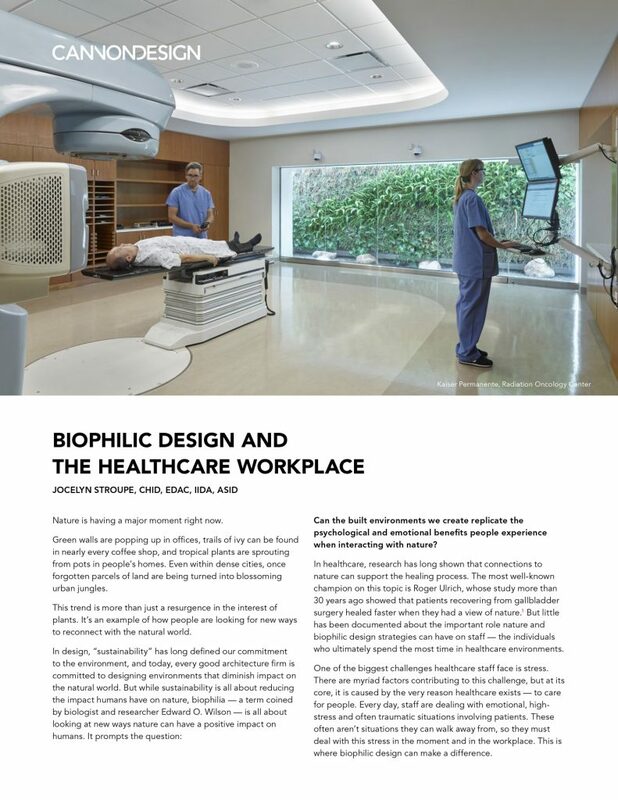 But while sustainability is all about reducing the impact humans have on nature, biophilia is all about looking at new ways nature can have a positive impact on humans. It prompts the question: Can the built environments we create replicate the psychological and emotional benefits people experience when interacting with nature?